Come for a drag queen guided ride through the Australian desert in a lavender-colored bus! 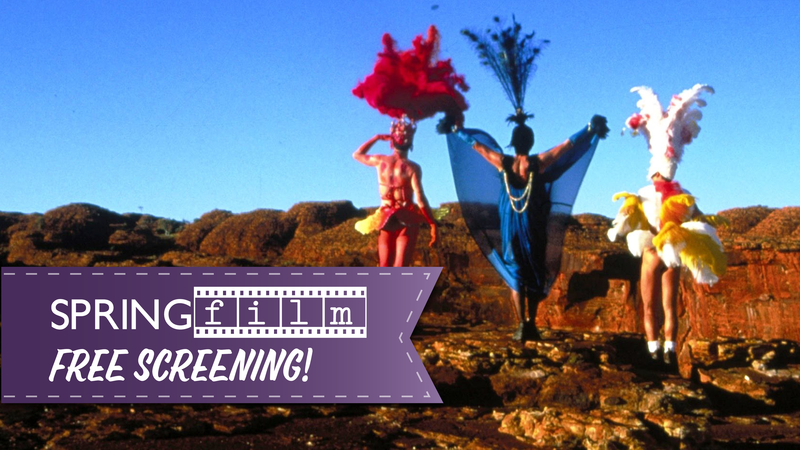 Please join us on Thursday, February 7, at 6:30p.m.at the Wildish Theater for the Springfilm On the Move free screening of The Adventures of Priscilla: Queen of the Desert. The film follows Sydney-based performer ‘Tick’ Belrose (Weaving), who accepts an offer to perform his drag act – Mitzi Del Bra – in Alice Springs, a remote town in Central Australia. Joined by fellow performers Bernadette, a transgender woman played by Terence Stamp, and the obnoxious Adam/Felicia Jollygoodfellow (Pearce) they encounter a host of both friendly and homophobic Australians as they travel through the Outback. Winning the Oscar for best costume design in 1994, ‘Priscilla’ was recognized for introducing LGBTQ themes to a mainstream audience and has since been turned into an award-winning musical. Starring Hugo Weaving, Guy Pierce, Terence Stamp and Bill Hunter; directed by Stephan Elliott; 104 minutes; 1994; Rated R.
Springfilm On the Move continues on March 28, 2019 with The Dark Crystal. Through August 2019, Springfilm will feature a monthly free screening of a film where travel is part of the plot.